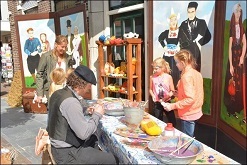 You want your guests to be actively and creatively involved in an original and typical Dutch way? Then this is it! A fun clog painting workshop! 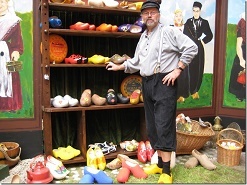 The workshop has a atmospheric setting with decorative panels, a wooden cheese closet with several painted clogs, props and guidance in theme costume. 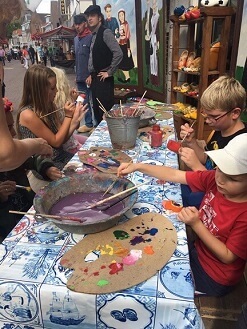 The guests/ visitors can take place at a wooden table and paint their clog with fast drying acrylic paint. Ready? 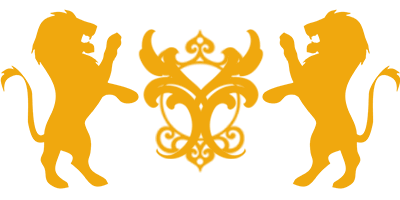 This is your own personal created Dutch souvenir. 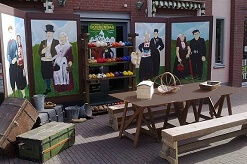 Including 1 person guidance, 4 hours, 100 wooden shoes 10 cm., decoration and all materials needed. Excluding 21% VAT. Foot size clogs are possible to. This setting can be customized with more seats, more clogs and more guidance.